"A tasty, guilt-free way to eat your greens! I love experimenting with different flavors of kale chips, and this has become one of my favorites!" Preheat oven to 300 degrees F (150 degrees C). Line 2 baking sheets with baking parchment. Wash kale. Remove and discard ribs. Dry leaves thoroughly, using a salad spinner if available. Make sure no moisture remains. Tear kale leaves into 2- to 3-inch pieces. Blend olive oil, Sriracha hot sauce, lime juice, and salt together with a whisk in a large bowl; add kale and toss to coat. Divide kale onto prepared baking sheets and arrange so there is no overlapping of pieces. Bake in preheated oven for 15 minutes, flip any pieces getting too browned on the bottom, and continue baking until the kale is crisp, about 15 minute more. Let kale chips cool 3 to 4 minutes before serving. 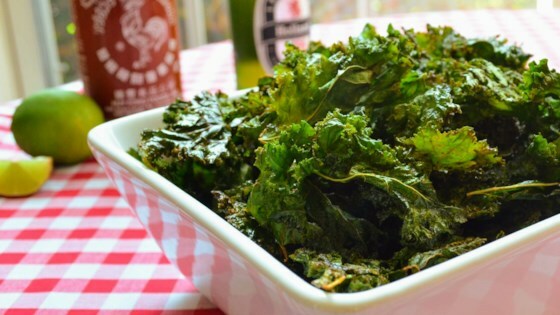 Homemade, crispy, oven-baked kale chips. Line baking sheet with parchment paper or foil for easy cleanup. 30 minutes is a guideline; adjust cooking time based on your oven. Keep an eye on the chips so they do not burn or get too dark. It's okay. Kale's not my favorite, but with all the stuff on it this is edible. I like the premixed kale salad's you can buy now. Probably stick with those for my vitamins! Cannot eat spicy things so I used toco seasoning instead of sriracha! Very good! Adjusted cooking to 350 degrees for 10-12 minutes. Much faster turnaround when baking multiple batches. Also added 1/2 tsp. Garlic salt per batch. Fantastic balance with the kale flavor. I have made these 2 nights in a row. Tonight we doubled the sriracha. Within 10 minutes the entire batch was gone! Even the dog loves them!